The African clawed frog is one of the easiest frogs to care for. They’re completely aquatic so a small-sized aquarium will suit their needs perfectly. 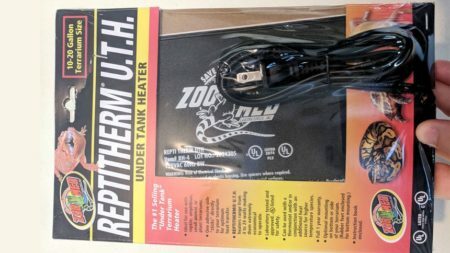 Not only do they not require a large tank, they eat nearly anything you place in front of them, they’re hardy and widely available online and in pet stores. African clawed frogs are an interesting species and great for beginners. In captivity, African clawed frogs can live up to 30 years. Adults can grow up to 4 – 5 inches and they’re incredibly hardy; Some keepers have reported them surviving for days and weeks without food (although I don’t recommend intentionally starving your pet). The African clawed frog is native to regions in Africa like Nigeria and Sudan. They have, however, been introduced into parts of South America and even Europe. Because they’re 100% aquatic, they can be found in ponds, streams and other bodies of water in sub-Saharan Africa. Probably the most notable feature of this species is their claws. They have webbing between their claws on the hind legs but no webbing on the front. This, accompanied by the country they hail from, is the reason they’re named “African Clawed Frogs”. Also, this species is often confused and mislabeled as an African Dwarf Frog in pet stores. They’re very similar in appearance but have some small differences; not having webbed front feet and having eyes on top of their heads. 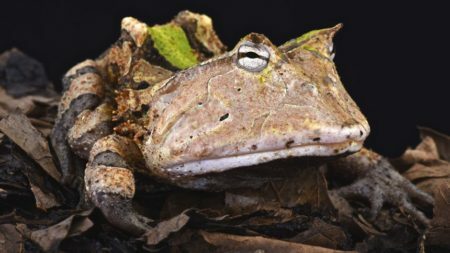 Xenopus, or “African clawed toad”, have eyes positioned on top of their heads. They are constantly scavenging for food and looking above, waiting for food to fall. A lateral line system spans the length of their body, giving them the ability to sense movement. This, accompanied with their sensitive fingers, makes them adept at locating a range of food sources. As I mentioned above, they eat almost anything. They use their claws to shred organic matter such as dead fish and even tadpoles. 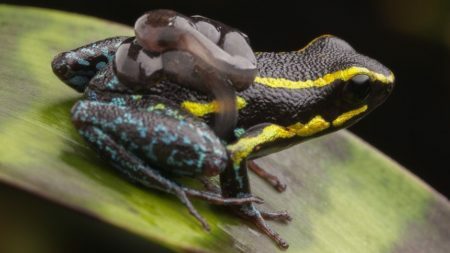 They are currently the only amphibians known for doing this. Place medium sized gravel on the bottom of their tank and fill it with at least 12 inches of clean, dechlorinated water (see the water quality section below for more information) and decorate using live or artificial plants. Providing a hiding place for your African clawed frog is a must. They like the safety of hiding among plants, in hollowed out logs and decorations, etc. 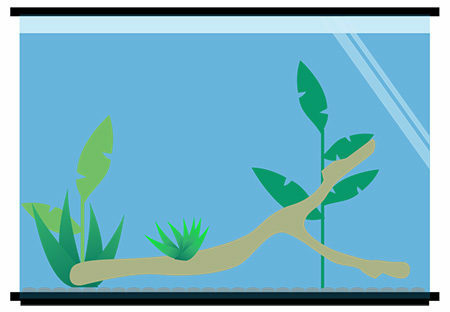 An example of how to set up a tank for an African clawed frog. While African clawed frogs survive in stagnant water in the wild, you should not let them swim in dirty water in captivity. 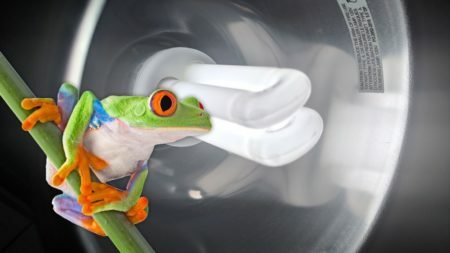 It needs to be cleaned at least once a week or you can install an amphibian friendly water filtration system to decrease the amount of cleaning required. One of the best qualities in caring for this type of frog is you do not need special lighting. While some frog species require UVB and basking lamps, the African clawed frog survives just fine without them. Now, having said that, if you want to provide a light for them, you can. Many keepers use a hood light above the tank in order to see them better. You would be wise to give them a normal light cycle though. Try to provide them with 12 hours of dark and 12 hours of light. This is yet another admirable quality for African clawed frogs; They do well at room temperature. So long as the heat stays between 65 – 75 degrees Fahrenheit, your little aquatic frog will be happy and healthy. A substrate of medium or large sized gravel is generally what you see on the bottom of most African clawed frog’s tanks. Using small gravel or pebbles is frowned upon because this species can accidentally consume it while eating. Pebbles, once inside your frog, will remain in their stomach and will not be digested. The build-up of rocks and pebbles inside your pet will result in serious injury and even death! Because of this, many keepers opt for using gravel that is too big for your frog to consume. Among the items listed above, the fastest way is to use a dechlorination agent. These water conditioning agents are cheap and readily available online or at your local pet store. It’s probably the most utilized method because they remove both chlorine and chloramine. 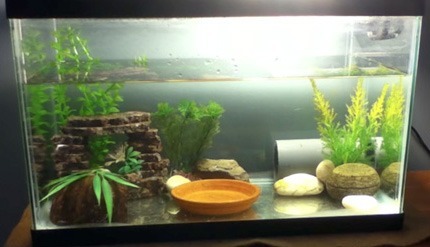 Another option is to fill the aquarium with tap water and let it set for 24 hours. The chlorine will evaporate out, leaving you with dechlorinated water. However, this option might not be safe depending on the water in your local area. Some jurisdictions add chloramine to drinking water which is harmful to amphibians; letting the water sit for 24 hours will not remove chloramine. I suggest calling your city to find out what they add to their water supply. Using bottled water* The final option is to buy bottled water. Salts and minerals are usually added after the water has been treated, making it a great option for frogs. This is generally considered a safe method and is common practice among amphibian keepers. Feeding your African clawed frog is one of the most enjoyable aspects of owning one. Once tamed, they have been known to take food directly from their keeper’s hands! The occasional nibble on your finger is common-practice but fear not, it won’t hurt because this species doesn’t have teeth (or a tongue, actually). 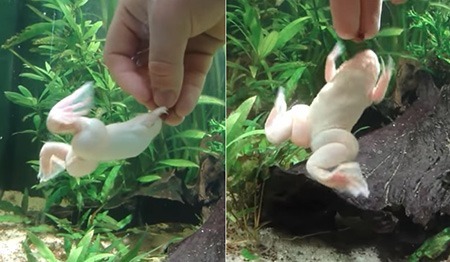 A picture of an albino African clawed frog eating from its owner’s hand. You have plenty of options when feeding your pet. Aquatic frog & tadpole pellets are readily available at your local pet store. You can also feed them waxworms, minnows and other feeder fish, bloodworms, and earthworms. They’ve even been known to eat dog and cat food as well. Nearly any kind of organic food material, dead or alive, floating near your African clawed frog will be consumed. Whatever you choose, remember that a balanced diet is best. Feed them a variety of food and they will remain healthy. As far as how much you feed them largely depends on their age and size. I suggest only feeding them what they will eat in roughly 30 minutes and feed them daily. Overeating is less of a problem then undereating; When they are full, in most cases, they will simply stop eating. Pay attention to your frog’s size, though, and feed them accordingly. If they’re a little overweight, try feeding them once every other day. If they’re skinny and don’t look healthy, you should feed them more often and consider giving them supplements. In the wild African clawed frogs lay eggs during the rainy season; from late winter into the springtime. In captivity, however, they often reproduce spontaneously. This isn’t always the case. 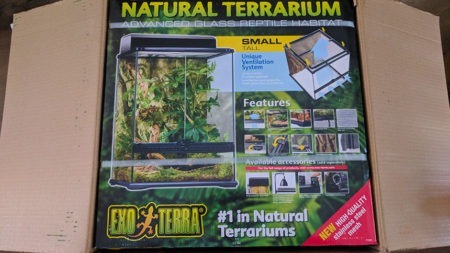 Should you decide to breed your frogs, I’ve compiled a few tips to help you get started. Before we dive into it, perhaps its best to start with “sexing”. 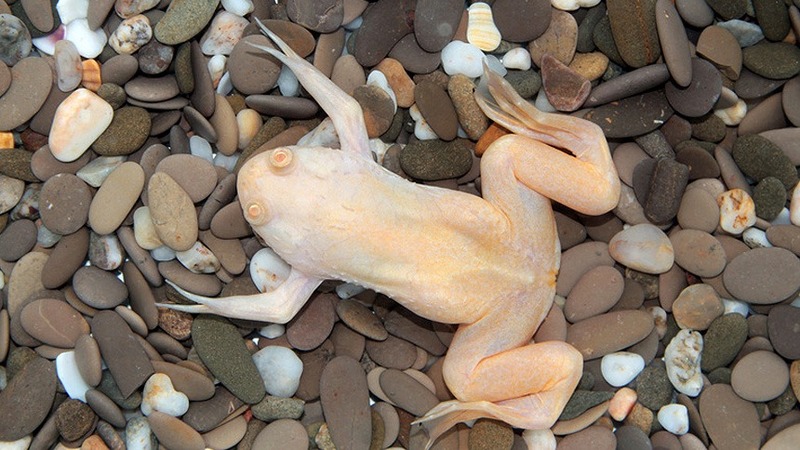 Female African clawed frogs are bigger than males by roughly 20%. They are also described as being more “plump” with chubby legs. A small bump can be seen between their legs where eggs are passed (this is called the “Cloaca”). Males are smaller, sporting slim legs and a nuptial pad on their forearms which is black in coloration after reaching maturity. Now that we’ve established the differences in males and females, I’ll list a few tips for breeding African clawed frogs. 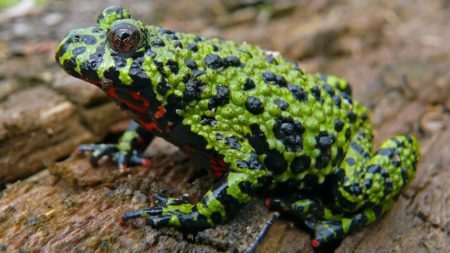 Simulating a spring-time rainstorm is a sure-fire way to help your frogs reproduce. In order to simulate a spring rain, most keepers will lower the temperature of the water to 65 – 68 degrees Fahrenheit and allow the water level to drop a few inches. These conditions are held for 30 – 45 days. Meanwhile, clean their enclosure by doing partial water changes. After 4 – 6 weeks, increase the water temperature to 75 – 80 degrees Fahrenheit and increase the water level back to normal. This will simulate a spring-time flood and should induce reproduction. I suggest doing this before night time. After you increase the temperature and water level, shut the lights off and leave them alone. Darkness gives them a sense of security which is always an added benefit. Once the mood is right, so-to-speak, the male frog will call out to the female. The sound is best described as a cricket under water. Sometimes this call also accompanied by a dance. In return, the female will respond with a clicking noise. The male, using his arms, will grasp just above the female’s rear legs (this is known as “Inguinal Amplexus”) and essentially squeeze her. The eggs will pass through the female’s cloaca and the male fertilizes them outside of the body. A female can lay hundreds of eggs and the entire process can last from two hours to two days. Once mating is finished, you should remove the eggs from the frog’s tank. African clawed frogs, when hungry, have been known to eat their own eggs. Place them in a separate tank with clean water at a temperature of 80 – 82 degrees. These eggs will hatch in 48 – 96 hours. The new African clawed frog tadpoles will feed on micro-organisms and will transform into froglets in about two months. You’ve probably guessed by now, seeing as these are aquatic frogs, that handling an African clawed frog is not something you should make common-practice of. If you’ve decided not to use a water filtering system, you’ll need to clean their tank at least once a week and transferring them to a safe location is okay. Be mindful not to stress them and avoid handling them as much as possible. Once tamed, however, these frogs have been known to eat food from their keeper’s hands. This can be an enjoyable aspect instead of handling. What sort of filtration system? Can you be very specific, maybe even suggest a few brands? I don’t think a filtration system is really “optional” unless I’m maybe doing it wrong/using the wrong tools. So sorry for the late reply. The filtration system is definitely optional. some keepers prefer not to use them as they believe the noise/vibration of the system is harmful to the frog(s). Personally, I don’t believe that but I respect the beliefs of those who do! If you don’t use a water filter, simply clean the water manually – perform partial water changes as needed or, if need be, do a full water change. Anyway, as for the water filter, that can be a touchy subject due to the number of different filters and types of filters (mechanical, biological, and chemical). A tetra whisper filter is a popular item due to low vibration. I hope this was helpful!